Global brand for innovative sanitary products was voted among the top 3 of the 'most sustainable big companies in Germany'. United Arab Emirates , Dubai , 27 January 2019. 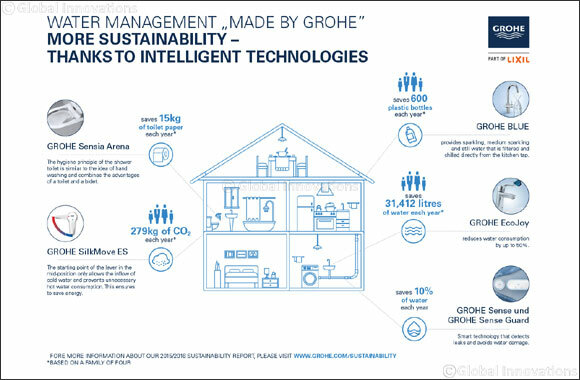 For the third time, GROHE, a leading global brand for complete bathroom solutions and kitchen fittings, has successfully achieved a leading position at the German Sustainability Award in the category 'Big Companies', making it one of the top 3 of the 'Most Sustainable Big Companies in Germany'. The award ceremony took place on Friday and was part of the conclusion to the German Sustainability Day which was celebrated with a festive gala in D�sseldorf, Germany. With the award, the German Sustainability Award foundation honours companies that combine economic success with social responsibility and environmental protection in an exemplary manner. It is Europe's biggest award for ecological and social commitment in different categories.